WASHINGTON -- Along with Chesapeake Bay, Puget Sound and the Great Lakes, the sprawling Columbia River Basin is one of the largest and most ecologically important watersheds in the United States. Unlike those other systems, however, the Columbia River basin which stretches from the Canadian border to the Pacific Ocean does not receive dedicated federal funding to clean up contamination that is found along its entire length. Nor is federal money set aside to repair damage habit or monitor conditions. That disparity was part of a Senate committee's focus Wednesday as well as legislation written by Oregon Democrats Sen. Jeff Merkley and Rep. Earl Blumenauer. "There has been investment to restore habitat and reduce toxics in the Columbia Basin, but it is less than a few million dollars a year and focused on habitat restoration or one time isolated studies," Debrah Marriott, executive director of the Lower Columbia River Estuary Partnership told the Senate Environment and Public Works Committee. "The magnitude of the problems exceeds what this level of investment can accomplish. Oregon and Washington invest heavily in the Willamette River Basin and Puget Sound. The Columbia does not share that level of financial support," she said. The federal government has provided some money in what Blumenauer calls a "piecemeal way." The government helps with restoring salmon and with cleaning specific sites. Without dedicated -- and enlarged -- funding from the federal government for a comprehensive approach, it will be difficult to protect the massive river system from such toxins as DDT, mercury and an assortment of pesticides. It will be difficult to product endangered steelhead and other species, she said. "Despite knowing the extent of the problems," she told the committee, "there is no sustained monitoring on the mainstream Columbia and no concentrated toxic reduction effort. ... There is now just one site on the lower river that is monitoring consistently. Scientists and community leaders determined that a minimum of 29 sites is needed to give an accurate assessment." 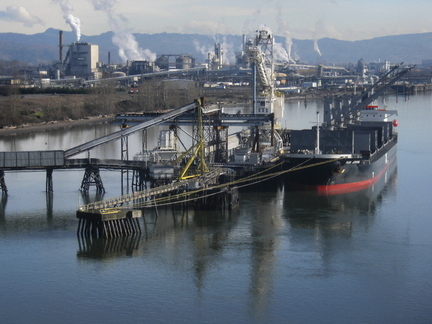 The legislation introduced separately by Merkley and Blumenauer on Tuesday aims to address those problems and put the Columbia River on a similar funding status as Puget Sound and Chesapeake Bay. Each of those systems has received annual federal funding for years to underwrite a comprehensive and coordinated effort to clean up contaminated sites, slow pollution and reverse their decline. "The Columbia River basin is a system that defines the Pacific Northwest," Merkley, who is a member of the committee, said. "Unfortunately, this great river basin faces serious challenges. Our rivers are severly polluted. EPA found 92 toxic pollutants in the tissue of fish taken from the basin. The good news is that stakeholders across the region are working to clean up and restore the basin. ... But more needs to be done. The Columbia River basin is the only one of these great waterbodies that doesn't receive designated federal appropriations to support restoration," he said. If passed, Merkley and Blumenauer's legislation would authorize the federal government to spent up to $40 million a year through 2016 on restoring the river. That would put the 1,200-mile long system on a similar plane as Chesapeake Bay, which is receiving $50 million this year. The Obama Admininistration has asked for $63 million for next year. Puget Sound collects $125 million a year through 2015 while the Great Lakes is getting $415 million this year. "The dangerous pollutants that have accumulated in the (Columbia) river imperil not just the ecosystem, but salmon, other fish, and the people who consumer them," Blumenauer said. "As we look towards the Columbia River with a 100-year vision of the future, it is imperative that we not only restore this beautiful landmark, but protect public health and ensure sustainable jobs for future generations." Blumenauer added that the money would support about 800 jobs at a time when unemployment remains high in Oregon. Oregon Rep. David Wu as well as Washington Reps. Jim McDermott, Brian Baird and Jay Inslee are co-sponsors of Blumenauer's bill.